Rehydrates & adds shines. Free of: sulfates, parabens, phthalates, gluten, drying alcohol and artificial colors. Not tested on animals.Day in and day out, your hair craves one major thing - moisture! Soak it up with Hask Orchid & White Truffle Moisture Rich Shampoo. Packed with replenishing nutrients and concentrated amino acids to drench hair in supreme moisture. 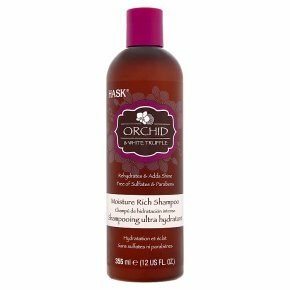 Luxurious European orchid helps hydrate and control frizz, while the richness of rare white truffle oil helps rebalance and restore overworked, brittle hair. Say hello to hydration heaven! Directions: Apply to wet hair. Massage into a lather, rinse thoroughly and repeat if desired. Ideal for daily use. For best results, use the Hask Orchid & White Truffle collection.